There isn’t much history, as the first celebration of this geek holiday was in 2011. 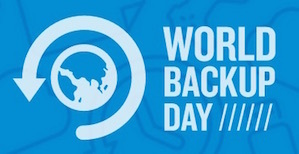 World Backup Day is less than a decade old. But the need is real, now more than ever before. Especially in light of this salient fact: April Fools’ Day. 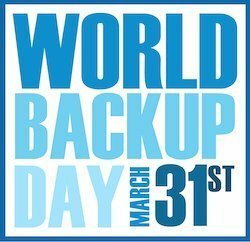 March 31, the day before, is an excellent time to check your backups. On the eve of the day famous for pranks, this might be your last chance. You may have learned at the University of Hard Knocks that it’s not a question of “if” you’re going to lose your data, but “when.” Having a redundant copy of it can make all the difference, and you may be able to skip the course at U of HK on Pulling Your Hair Out. 32% of data loss is due to human error… or cockpit error, or that space between the seat back and the keyboard. …and that does not even count the rise of ransomware incidences, which can immobilize consumers and paralyze businesses. Last year the city of Atlanta was held hostage by cyberattackers for $51,000 in bitcoin. Residents were unable to pay bills, go online to switch on water services and the municipal courts were closed. Last year sixteen hospitals in the UK had to cancel appointments and non-essential surgeries due to a ransomware attack. Now, your friendly neighborhood historian is all about redundancy, all about redundancy — and he’s happy to tell you this over and over again, many times in a repetitive and redundant fashion. But then, he used to be Product Marketing Manager for Backup in a previous role. The first thing he does when he gets a new computer is set up the backup routine. You can backup to tape (how 20th century), optical (how last millennium), thumb drive, or memory card. In many cases, while the capacity may be limited compared to other technologies, it has the advantage of being mobile. You can take it with you, or offsite against the threat of disaster. You can backup or sync to either a local hard drive or even a solid state drive (SSD) which is often faster than removable media and offers greater capacity. It can be automated via backup software or even system software like Apple’s TimeMachine or Window’s Backup and Restore Center. However, unless it’s a mini-drive, it’s probably permanently attached to your computer, and rarely taken offsite. So you’ve got protection, but not disaster recovery capabilities. Cloud computing is a popular trend that I write about elsewhere, and Backup as a Service (BaaS, a subset of Data Protection as a Service) is an increasingly easy and effortless way to do a backup. Using consumer services like iDrive, Mozy, or Carbonite, you can send your data across the Internet to a Data Center, where your information is stored in their storage arrays. Good news: relatively inexpensive monthly or annual subscription for the service, and you don’t have to buy any hardware. Bad news: it can take days or weeks to initially backup all your data into the “cloud,” but after that only incremental changes are uploaded. But the big difference here is that your data is offsite, in case there is a disaster at your office or home. You can recover it over the Internet — which could take a long time — or some services will ship you a hard drive or DVD with your data, for an additional fee. Cons: slow initial backup, slow restore, may offer limited capacity (Example: iCloud, iDrive), the policy may change. Example: CrashPlan no longer offers a consumer product. Which is the best? A combination of more than one of these is a Best Practice. One study shows that of those who do a backup, 54% have only one backup, 45% of business data users have more than two copies. It’s even more important to test that backup, to see if you can successfully recover your data from the backup. I use all three methods: different media, different locations. And it’s always good to have one backup offsite. Redundancy of data is important. And this article will go out through my blog, Twitter, and Facebook. The real test though is this: have you celebrated a successful World Data Recovery Day? Are there any other IT related “holidays” that you are aware of?